Domus Terrazzo offers resinous epoxy flooring for any type of environment including warehouses, processing plants, manufacturing, distribution, transportation facilities and more. With the addition of mosaic vinyl flakes and decorative quartz, projects can have endless design options. Understanding the selection process of the applications is vital to the success and longevity of the floor. As a solutions provider, we’ll walk you through the process to make sure that the proper flooring will be implemented to meet your projects needs. Download our Resinous Flooring Brochure for aggregate options and an overview of each flooring system. 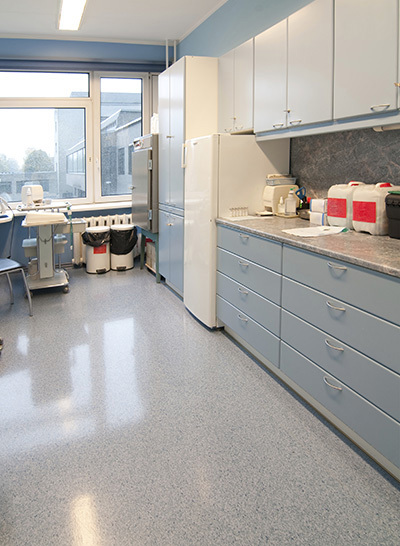 Download the following System Bulletins for a step by step process to give you the confidence needed when preparing and installing resinous flooring. Water-based epoxy primer designed specifically for damp or green concrete. 100% solids, low viscosity primer designed to penetrate damp concrete and to control concrete surfaces that exhibit high moisture vapor emission. 100% solids, moisture insensitive epoxy primer designed for concrete, wood and masonry surface application. 100% solid, flexible epoxy membrane designed to suppress reflective cracking in Terroxy Resin flooring systems. The unique bonding and elongation properties of the polymer provide extraordinary crack suppression and is recommended for use over interior concrete surfaces prior to the flooring’s installation. 100% solid, highly-flexible epoxy membrane designed to reduce sound transmission and suppress reflective cracking in terrazzo flooring systems. The unique bonding and elongation properties of this polymer provide extraordinary crack suppression and is recommended for use over interior concrete surfaces prior to the flooring’s installation. Permanent, high performance coating designed for high-traffic interior applications. High solids, two component epoxy resin used for general purpose decorative aggregate and heavy duty resinous flooring systems. Binder Resin possesses a good chemical resistance, with excellent compressive strength and abrasion resistance. A two-component, re-coatable epoxy and binder resin. It may be used directly over primed substrates. Industrial Coating is extremely hard wearing, chemical resistant, impact and abrasion resistant. Terroxy Industrial Coating is available in a variety of colors. Industrial strength translucent, epoxy resin intended for use in a variety of interior flooring systems. Has excellent UV resistant properties. A unique high solids resin utilizing polyaspartic technology. It has been formulated to produce a fast curing, durable coating with excellent ultraviolet and weathering characteristics, matched with good chemical resistance, high temperature performance (to 300ºF/149ºC) and will cure at low temperatures (to 35ºF/2ºC). Terroxy Urethane Concrete is a three-component water-based polyurethane cement for concrete flooring. This system is odorless, contains no VOC’s or HAP’s. Properties include excellent chemical resistance against acids, bases, oils, and organic solvents. Urethane Concrete has a low viscosity that is trowel applied and back-rolled for a smooth finish.